London has utilised its strengths to become the centre for international finance, but that is now in question. This is evident in London having the largest share of the global FX market ($5 trillion/day traded) and the financial derivatives market, and hosting a leading amount of international companies on the London Stock Exchange. 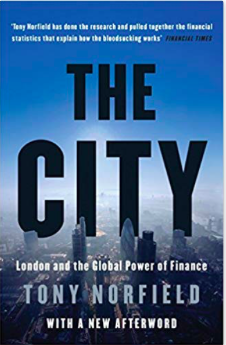 In The City, author Tony Norfield uses his twenty years’ experience to explain how London fits into the finance game in an international context and how the international financial system works. The book is insightful in explaining how London came to be the centre for international finance, despite the UK’s decline through the 1900s and the emergence of economies worth multiples more than the UK’s. In the beginning, the author reveals that some of the research used in this book was used for his Ph.D. in 2014 and it shows. In fact, I found the book’s title and blurb on the back a bit misleading, as it makes it seem like it’s about the City’s history and rise up to the present day. Rather, there are stretches of the book that read like an economics textbook, in explaining how the international financial system works. Unless you have an affinity for charts and tables, you’ll find it a bit dry, as I did. However, this shouldn’t discourage you from reading it if you’re interested in the City as there are some golden nuggets of information and he does shed light on London’s place in the world and its unique strengths. As Norfield shows, two key strengths of London were the quick Eurodollar adoption and LIBOR. Eurodollars are deposits denominated in US dollars held outside of the US, and thereby outside of US regulation. LIBOR enabled banks to loan money between themselves to facilitate deals and transactions for their clients. LIBOR sets interest rates that are used globally. There is no equivalent to LIBOR, even now. These two key strengths made London the centre for servicing international clients, with the City acting as an intermediary using other people’s money and currencies to facilitate international commerce, taking a cut in the process. Whilst this may not seem like much, with the dollar value passing through in a day in the trillions, these cuts add up to a lot. Today, the City’s position is under threat from a ‘hard’ Brexit. To be clear, I know London won’t disappear or become irrelevant, but having a less favourable relationship with the world’s largest economic bloc will have consequences. It may result in some business being shifting to the Continent. A sizeable portion of London’s business is in clearing euro-denominated securities but being outside of the EU means that the UK will not be able to fight regulation requiring them to be cleared in a Eurozone country, as the UK successfully did in 2015. The importance of the City in compensating for the deficit of goods will be felt going forward. Those who voted ‘Leave’ may find that using it to stick it to London will backfire on them by reducing the Government’s ability to provide financial support for their region or industry. It is also a self-inflicted wound that will speed up the rise of Asian cities, which is already evident. Within three years’, London’s share of parts of the global finance market, such as FX, has fallen whilst the share for Hong Kong/China and Singapore has risen. Reading this book in the aftermath of Brexit and its on-going uncertainty, in some ways the book reads as a love letter to London, although I don’t think that was the author’s intention. The book provided a great context and statistics to the City of London that I, and many others, work in and spend most of our time in. It illustrated the power of finance and the power that London has in finance across the globe, which was both eye opening and awe-inspiring.